What is Omeprazole Actavis (Omeprazole) used for? 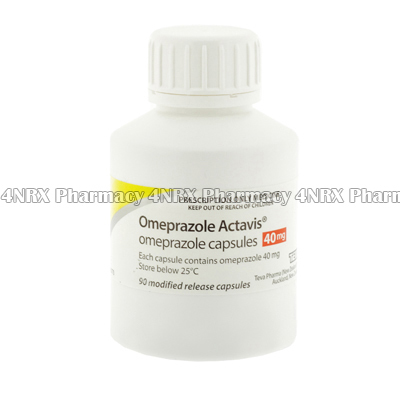 Omeprazole Actavis (Omeprazole) is an oral proton pump inhibitor prescribed to treat patients suffering from conditions caused by excess stomach acid production such as acid reflux disease, peptic ulcers, or damage to the stomach lining caused by the use of other medications. The medication reduces the process of excess stomach acid to prevent stomach pain, the formation of ulcers, or esophageal reflux. Your physician may also prescribe it for other unlisted purposes. How should I use Omeprazole Actavis (Omeprazole) ? Omeprazole Actavis (Omeprazole) should be used strictly according to your physician's instructions to get the safest and most effective results from treatment. The typical dosage is one tablet taken once each day, but your individual instructions will depend on the condition being treated, your current health, and the severity of your symptoms. These should be swallowed with a large glass of water on an empty stomach to aid absorption. Do not split or crush the tablets before use to prevent unintentionally destroying or altering the effects of their contents. What are the side effects of Omeprazole Actavis (Omeprazole) ? Side effects that may require emergency medical attention are low magnesium levels, severe diarrhea that is bloody or watery, or signs of an allergic reaction such as skin rashes, swelling, or difficulty breathing. These conditions may require reduced application frequency or lower doses to prevent further health complications from occurring. Do not begin using Omeprazole Actavis (Omeprazole) if you are allergic to omeprazole or if you have had a bad reaction to similar treatments in the past. It is also recommended to inform your physician if you have osteoporosis, a vitamin B12 deficiency, or decreased liver function as these conditions may cause unexpected problems during treatment requiring special adjustments to your regimen. Strictly follow all instructions provided to you by your physician or pharmacist while using Omeprazole Actavis (Omeprazole). Optimum and safe dosage can differ based on the patient and the condition being treated.